Emotions are triggered in the brain by thoughts, which are often unconscious. As part of human evolution, in order for us to survive, when we are confronted by a potential threat, we developed emotions like fear, anger or the urges to flee are triggered. You may know this as the “flight, fight or freeze response” sometimes it is called “amygdala hijack”. In our society today sometimes this reaction can be disproportionate to the actual situation. However when these emotions are triggered our capacity for rational thinking is diminished, and we are likely to revert to our habitual behaviours. 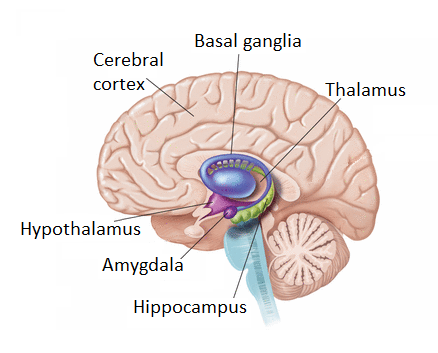 These behaviours are stored in the habit centre /basal ganglia. This area of the brain is responsible for managing semi-automatic activities such as walking or driving. Mindfulness helps us to recognise and observe our thought patterns. With practice we are able to develop the ability to recognise when thoughts arise, and observe them in a detached manner, without the need to become involved in them (thus not triggering an emotional or “automatic” reaction). This short video by Juliet Adams Founder of Mindfulnet.org explains what happens to our brain when we practice mindfulness. Recent research into neuroplasticity has demonstrated that our thoughts change neuro-pathways in our brain – the more we think about something, the stronger the neuro-pathway; just like any muscle the more you use it the stronger it becomes. Mindfulness helps us become more aware of our thoughts, and therefore able to actively shape our brains. When practicing mindfulness we all find that our mind will wonder as uninvited thoughts start to creep in to our heads. This is what brains do, but how we respond to these thoughts is important. If we start to think about the thought, or get annoyed with ourselves for not being able to retain our focus, it stops us paying attention and takes us away from the present moment. Mindfulness helps us to learn how to respond differently. Acknowledging the thoughts and thought patterns and let them go without judgement, we are able to retain our focus on our direct experience in the present moment.